I’m going to take a break from my Dave Moore series today, if only because I rather like this piece I’ve been working on and want to present it to you. “Fog” is likely the most well-known poem by Carl Sandburg without Chicago in its title, and it appears in many school textbooks where it serves as an introduction to metaphor. The Carl Sandburg who wrote it didn’t intend it to be a lesson. I think he wanted to write a Modernist, Imagist poem, the way a small group of others were writing them in the era roughly 100 years ago. One thing I’ve learned searching out pieces for this project was that Modernism in its High Modernism guise has overtaken the work done by those preceding Imagist pioneers. As those who’ve visited here during cruel April Poetry Month will know, I enjoy somewhat those knotty, learned, collaged and college-ruled works that T. S. Eliot’s The Wasteland laid out. And World War I, we should not forget, was a terrible disaster with near untellable loss of life and loss of hope for its generation. WWI probably had to change things. The Carl Sandburg who wrote his early Imagist poems went about his pre-WWI world with an open heart and open eyes. In his poetry and in his political writing there’s a panorama of evil and survival, loneliness and stubborn love. So, to reduce “Fog” to a lesson on metaphor is to amputate that context, and to forget the Imagist quest to renovate entirely metaphor as it had been received by Sandburg’s generation. Imagist poems often wanted to break through the fourth wall of metaphor, to make it more than an a decorative, this stands for that, analogy. “Fog” is fog, and the cat is a cat. Yes, they have meaning beyond that, all reality does. You could start by asking yourself, if this is a real cat then, what kind of cat is it? A house pet, one used to demanding the pricey wet food and best place on the dry, warm bed? No, it’s on the docks. It could be a ship’s cat, a fellow laborer, or a feral cat making do with what it can find there. It can’t call attention to itself for its prey and its own risk, and so it’s silent—and like its life and labor, obscured by the fog, by the cat’s own actions and the actions of the world. Sandburg sees his worth to see that. 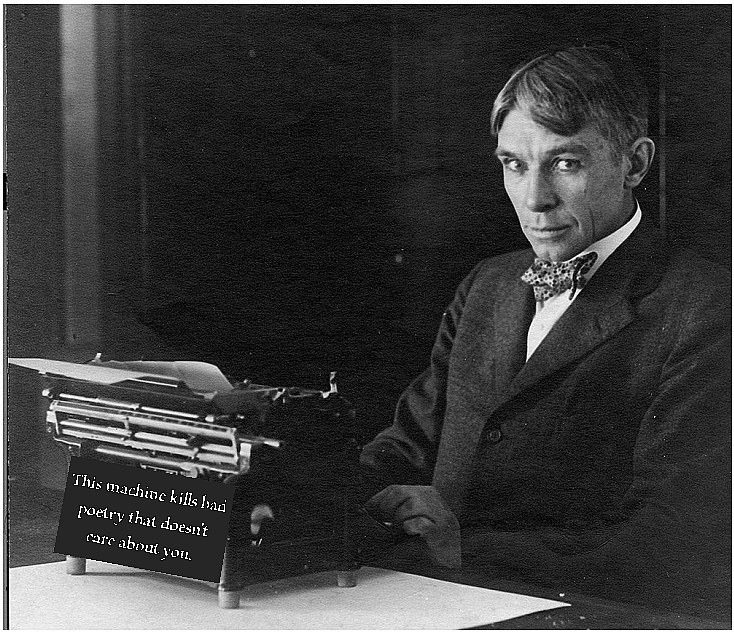 Carl Sandburg at the machine of his labor. That’s an Imagist poem, a direct presentation of reality, with no false rhymes of conventional or show-off imagery. There’s love and respect in it too, for the working common of us, singing the insubstantial and all-covering fog of our lives and labor, that save for the notice of the poet or artist, is silent and then moves on. That, dear readers and listeners, is why you should pay attention to Carl Sandburg, who’s nearly fallen out of the cannon of important Modernists and consideration as an important poet, who is, I tell you, as you are, more than an example of metaphor. Remember back to the formation of the LYL Band were we self-labeled ourselves as “Punk Folk?” Given that folk music by definition doesn’t ask for certifications or approval to be performed, that was something of a tautology. It occurs to me that what I’m doing here with pieces like this, using a string quartet I play part by part along with two pianos (one electric) and a drum set could be Punk Orchestral. My string parts are extraordinarily simple, like unto a lot of downstroke strums of power chords in some Punk. Decades back, the Pixies helped popularize the Punk soft/loud arrangement, but of course orchestral music did it OG before them, and I exploit that in this one. Some other incidental ideas that helped steer me in this piece came from reading some recent posts at the Brettworks blog, where a more trained and accomplished composer talks about some of his processes and inspirations. Specifically Brett was talking about creating a piano part that had enough space where the various notes could have enough time to express their decay trails. Musically, this piece started by exploring that idea, but then the string quartet decided to kick out their jam. I peform Sandburg’s words like a stalking cat hunts, sliding forward and stopping, then slipping forward again before pouncing. To hear this, use the player gadget below. What kind of cat is certainly worth asking. Back when I had two cats, they sounded like a herd of elephants coming down the hallway. My upstairs neighbors’ cat is no different. What could Carl have been thinking? But you’re right: a working cat might be very different. Hadn’t thought of that. Thanks. I think better of Sandburg now. Because “Fog” was so tied to school books I didn’t ask myself the question until recently and only after learning a few years back the extent of Sandburg’s own political radicalism and ties to Imagism. Reading his political works contemporary with his early poetry is eye-opening. The “landscape” in a Sandburg poem is almost always intimately tied with the people inhabiting it until the two become one. Like most I just remembered the poem as fog=silent like cat’s feet.That it was set in a harbor was forgotten, but I think intended. The High Modernists who were ascendant as the century went on never rated Sandburg as much of a poet, perhaps because his Modernist poems weren’t seen as having as complex imagery as their favored writers. He looked too simple, so they never dived in. Your cats were no doubt the pride seeking to remind you that the dead carcass hidden in the can or bag was theirs by right and that you should release it from your flimsy attempt to conceal it right away and leave it to them. This is a choose your dialectic adventure: working class arising to demand their economic justice or lazy parasitic ruling class extracting labor by force and unquestioned practices?